Club BellyDance…not once, but twice!! I remember the first time I saw the Belly Dance Super Stars. It was years ago at a small club in San Francisco. I’m pretty sure it was the first time that they toured. I was so excited. I had only been belly dancing a couple of years and had just been asked to join the local troupe and most of the troupe went to the city to watch the show. I had only attended hafla’s and festivals and had never watched a professional belly dance show and my jaw was on the floor the entire time. Rachel Brice and the Desert Roses, Dondi MCing, amazing new fashion of Melo’s being showcased by the tribal stars and the local guest troupe that had been asked to perform, FatChanceBellyDance®, was the cherry on top. In the years that followed I went to as many of the Belly Dance Super Stars shows as I could. I bought the CD’s and DVD’s and followed the careers of some of the dancers as they became internationally famous. Miles Copeland knows how to keep things fresh and new. While Belly Dance Super Stars still occasionally tours, Miles has now created Club BellyDance. It’s an event that is geared towards local clubs and venues showcasing local dancers for the first half of the show and the second half of the show is, you guessed it, Belly Dance Super Stars. WildCard BellyDance was excited when we realized that Club BellyDance was coming to our area and we were thrilled when Nathalie Tedrick asked us to dance in the first half of the show. 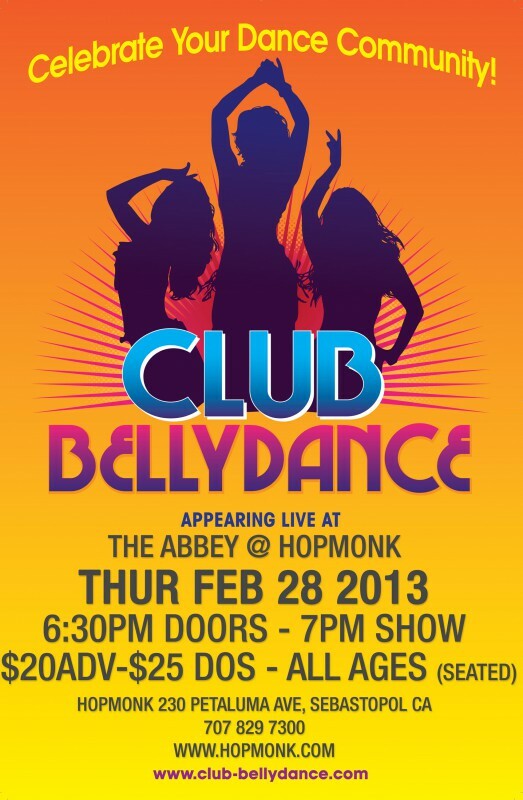 The show is happening Thursday February 28th at Hopmonk, in Sebastopol. Show starts at 7pm, and the doors open at 6:30. Tickets are $20 and this event will sell out so buy your tickets now. So you wanna know what the cherry on top of all this is?? Friday March 1st Club BellyDance will be in San Francisco at the Brava Theater Center. FatChance BellyDance is organizing the first half of the show and they asked us to perform!!!! This is an amazing honor and we are thrilled and blown away by it. So whether you live in Sonoma county or the San Francisco Bay area come and check out Club BellyDance and buy your tickets to watch WildCard BellyDance perform, not once, but twice! MEDGE presents it’s ninth annual Fall Festival, featuring Seba and WildCard BellyDance! Workshops, festival dancing, vending and live music, followed by an evening Gala Show! Doors for the Fall Festival open at 12:00 p.m. at Cozmic, 8th & Charnelton, Eugene. Festival dancing begins at 12:30 and continues until 8:00 p.m. Live music hour – 7:00-8:00 p.m. Gala Show starts at 8:30 p.m. featuring WildCard BellyDance! All of this wonderfulness for only $8, ALL DAY! (No separate fee for Gala Show). 2:00-4:00 p.m. - Tribal Spins: Love to Spin? We do too! That’s right baby! WildCard BellyDance is going back to the desert again this year for The Las Vegas Bellydance Intensive & Festival! We will be teaching a scimitar workshop there, and performing as well. Looking forward to a little bit of dance and deviance in the City of Sin! See the LVBDI registration page for more info on our “Dancing on the Edge” scimitar workshop that’s happening Sunday Sept. 9th at 8:30am ( that’s right just stay up all night and greet the dawn with something sharp). We are performing at the festival at 2:30 later on that day. Come and see all the cool stuff you learned at the workshop in action! Here is a taste of last year’s festival performance. Join WildCard BellyDance on the Queen Mary for MECDA’s n35th annual Cairo Caravan. It’s time for another WildCard BellyDance road trip. This time down to Southern California to Cairo Caravan. We have a special place in our collective hearts for boats. Every year we have the annual party barge trip, on Lake Sonoma, but this time we are going to the Queen Mary! They tell me it’s dry docked so at least I won’t fall into the water. LOL All the fun happens June 1-3rd at MECDA’s 35th annual Cairo Caravan. WildCard BellyDance hits the Luxor Stage at 3:15pm on Saturday June 2nd. See http://www.mecda.org/cairo for more information.